In 1997, the Orange County Board of Supervisors announced the creation of a 23-member task force to begin the process of revitalizing Dana Point Harbor. Along with the task force, the county released a concept plan to the public. At the time, Bill Clinton was just beginning his second term as president, the Twin Towers of the World Trade Center were still standing in downtown Manhattan and the Los Angeles Lakers were still playing at the Forum in Inglewood, with Kobe Bryant completing his rookie season. This week marks the start of 2015. Another Clinton could be running for president, a new tower has since been erected where the Twin Towers once stood, the Lakers have spent two decades playing at an arena in downtown Los Angeles and Bryant is on the verge of playing his final season of professional basketball. Yet, no one has even broken ground on the Dana Point Harbor Revitalization Plan. At a recent Board of Supervisors meeting, outgoing supervisor Pat Bates, who represented Dana Point on the county level, said she was hopeful for a groundbreaking at some point during her successor’s term. Interestingly enough, Bates’ successor is former Dana Point Mayor Lisa Bartlett. It has almost been 18 years since the 23-member task force was created, a length that could grow to 22 years if ground is not broken on the revitalization plan before the end of Bartlett’s first term as supervisor. Currently, the rehabilitation plan features a $150 million budget and proposes to renovate or replace 20 boating-themed and commercial buildings and adding 30,000 square feet of commercial, office, restaurant and retail space. 1997 – Orange County Board of Supervisors creates 23-member task force to begin the process of revitalizing Dana Point Harbor. 2003 – Board of Supervisors selects private firms to oversee developments of master plan, environmental impact report and design and construction concepts. 2005 – Environmental Impact Report recommended for certification by Orange County Planning Commission. 2005 – Board of Supervisors approves stand-alone O.C. Dana Point Harbor Department to oversee waterfront’s operations. 2006 – Board of Supervisors certifies Environmental Impact Report and approves Dana Point Harbor Revitalization Plan. 2006 – Dana Point Harbor Revitalization Plan approved by Dana Point City Council. 2006 – Local Coastal Program Amendment submitted to California Coastal Commission. 2006 – Work begins on renovating harbor’s launch ramp. 2007 – Launch ramp renovation completed. 2007 – Officials begin drafting Subsequent Environmental Impact Report for revitalization plan’s waterside projects. 2008 – Dana Point Harbor is dredged. 2009 – Local Coastal Program Amendment approved by Coastal Commission for the land use planning phase. 2010 – Coastal Commission approves final certification of the Local Coastal Program Amendment for the land use planning phase. 2011 – Coastal Commission unanimously approves a tweaked implementation plan for Dana Point Harbor revitalization. 2011 – Dana Point City Council holds public hearing to consider Coastal Commission’s “suggested modifications” to Dana Point Harbor Revitalization Plan. 2012 – Board of Supervisors approves $7.4 million contract agreement to analyze, design and plan first phase of Dana Point Harbor Revitalization Plan. 2012 – Orange County Planning Commission unanimously approves final Subsequent Environmental Impact Report. 2012 – Board of Supervisors unanimously approves revamped Dana Point Revitalization Plan. 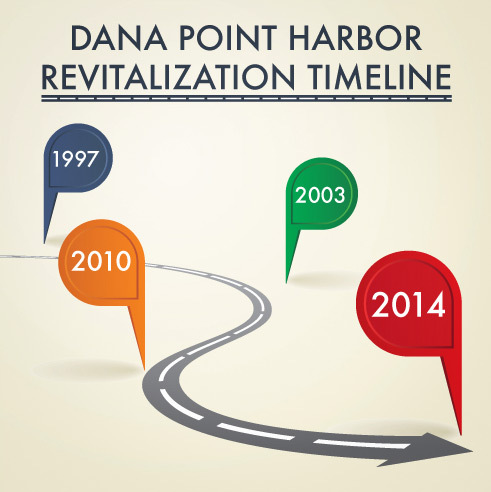 2013 – Dana Point City Council approves latest iteration of Dana Point Revitalization Plan. May 2014 – Dana Point Planning Commission approves Coastal Development Permit application for landside improvements. May 2014 – Boaters 4 Dana Point Harbor appeals Dana Point Planning Commission’s approval of Coastal Development Permit application. June 2014 – Dana Point City Council rejects an appeal of Dana Point Planning Commission’s approval of Coastal Development Permit application. September 2014 – Orange County CEO Michael B. Giancola’s responses to Dana Point Harbor Grand Jury Report are unanimously supported by Board of Supervisors. November 2014 – After latest appeal, Dana Point City Council unanimously approves updated Coastal Development Permit application. November 2014 – Board of Supervisors approves Dana Wharf tenant lease amendments.